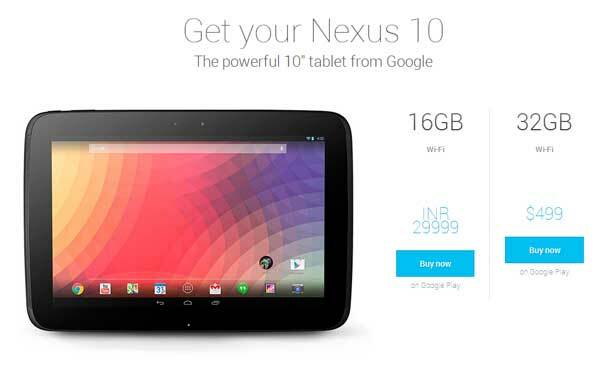 While we just saw the recently announced Nexus 5 and the Nexus 7 (2013 edition) listed on the Indian Google Play store, Nexus 10 has been added to the list, showing the company’s sudden interest in the Indian market. The Nexus 10 tablet, which was launched way back last year, has finally been listed on the Indian Google Play store as coming soon. The device has been priced at Rs. 29999 for the 16 GB Wi-Fi model. It is quite possible that the device would be launched in India on November 12, along with the Nexus 5 and the refreshed version of Nexus 7. The Samsung built Nexus 10 tablet has a 10 inch display with a high resolution of 2560 x 1600 pixels. The device is powered by the Samsung Exynos 5 dual core processor along with 2 GB of RAM and 16 GB of internal storage. The tablet is also equipped with a rear facing 5 MP camera and a front facing 1.9 MP camera.